We have served as thermal experts in cases across England, Wales, Scotland & the United States since 1998. Where practicable, we act as Single Joint Witness under the Civil Procedure Rules - CPR - which stress the primary duty of an expert as being to the Court. In any event, we may be relied upon to give accurate technical advice. Not all our commissions are necessarily intended for formal litigation. We have a strong record in Expert Witness ADR, either independently or working with instructing solicitors, and most of our cases are settled out-of-court to general benefit and satisfaction. The Environment Agency had been called in response to complaints of excessive vapour plume emission from the exhaust stack of a shell & tube boiler, fired by wood waste from the furniture factory where it was installed. The system was losing water, although visual inspections had showed no defect. Our investigation proved this to result from the boiler having been built using faulty tubes: the seam welder had "missed" a significant length of run as the formed section passed through the mill. Notedly, inspections at tubemill, stockholder, converter and the boiler manufacturer had all passed unremarked. 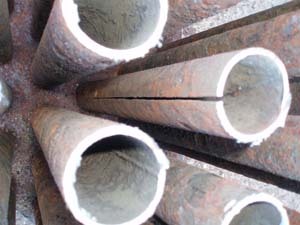 The affected tubes sprang apart when cut through, as shown in the photo. Summary Judgment was obtained and applied. A quite different instruction entailed investigation into equipment installed at a carp breeding establishment. Stock was being lost through pond temperature variation and water quality. We undertook a thermal failure and effect analysis, then designed and project managed rectification works. Given our extensive research, development and applications experience of evaporative systems, we have provided expert services - directly and indirectly associated with plant type and performance - including outbreaks of Legionnaires’ Disease at a high-profile inner city industrial site for which detailed knowledge of cooling towers and their operation was prerequisite.